If exercise and a strict diet for weight loss were unable to prove successful for you, and you ended up having a bariatric procedure to combat your obesity, you’ve likely quickly determined that the surgery was the easy part and that living with the associated lifestyle and habit changes can be confusing and difficult. Depending on what type of digestive system surgery you have had, your doctor might speak to you about gastric bypass vitamins. Gastric banding, for instance, doesn’t normally require a nutrient supplement because none of the intestine is bypassed; and, sleeve gastrectomy complications can be plentiful, but usually not related to nutrient deficiencies because the intestine isn’t normally fiddled with, merely the capacity of the stomach. However, other surgeries that bypass the nutrient absorbing parts of your food processors mean that you’ll likely be taking gastric bypass vitamins. Here we will explore the critical nutrients often recommended after many types of digestive surgeries. Ironically, if you happen to have vitamins for weight loss lying around the house from your pre-surgery days, you might already have what you’ll probably end up taking. 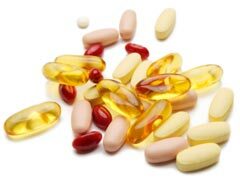 The vitamins found in many multivitamins are essential to proper health both if you have had a G.I. procedure and if you have not. Your post surgery care team comprised of your physicians and nurses will help you find supplements that are ideal for you, but there are some common gastric bypass vitamins that you will likely be taking. For instance, iron, zinc and magnesium are probably going to be in whatever product you are taking, as are thiamine and folic acid (important for gastric bypass and pregnancy patients as well as post op.) Additionally, you will likely be taking a supplement containing vitamin (b12), vitamin D and calcium. Remember to discuss any and all supplements you are taking with your health care provider. He or she will determine the best post-op gastric bypass vitamins for you. It’s important, especially after surgery, to always discuss any vitamins, supplements, or over the counter medications that you are taking with your doctor. He or she will be able to determine if they are alright for you to take, and whether or not there is risk for drug interactions, or complications arising from your current existing health conditions. He or she will also want to continually test for appropriate levels of all nutrients, specifically after your operation and in the follow up months. Mini Gastric Bypass No Surgery - Pros and Cons!